Colt’s evaporative cooling and ventilation systems use the cooling power of water to reduce the temperature inside warehouses and large industrial buildings, creating a favourable environment for working or storage. They only need a small quantity of electricity for the fan that circulates the air. Running and maintenance costs are extremely low and the warmer the outside air, the more efficient evaporative cooling is. 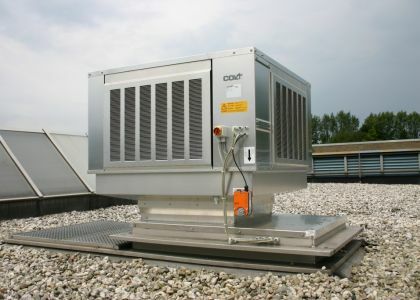 Colt evaporative cooling systems supply 100% fresh air, maintaining optimal air quality. They are designed to ensure optimal water quality. All systems are tested and comply with VDI 6022, and furthermore CoolStream S is ceritifed to that standard. They are particularly effective in large spaces – industrial or commercial buildings, warehouses – where a pure ventilation system is unable to provide an internal climate suitable for working comfortably or storing goods safely. Colt is able to design an integrated evaporative cooling and ventilation solution, or boost the cooling capabilities of your existing ventilation system with its evaporative cooling technology.